In February 2018, Marina Bistrin interviewed Sim Hanscamp, the owner of Spoke & Spade. 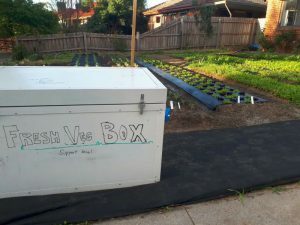 Spoke & Spade is a small urban farm in Heidelberg West which grows vegetables and sells them in boxes. I met Sim Hanscamp (short for Simeon) at the Heidelberg West Food Swap and found out he had an urban farm nearby from where he is selling veggies, so my friend and I visited him shortly afterwards at his house and urban farm in Coomalie Crescent, Heidelberg West. He is a friendly young man who has started his own business, supported by the government’s New Enterprise Incentive Scheme (NEIS). He has converted his rental property’s front and back gardens into an urban farm and is using the community-supported agriculture (CSA) model to pre-sell veggie boxes. He also has an honesty box in the frontyard with freshly picked veg and herbs for a donation. 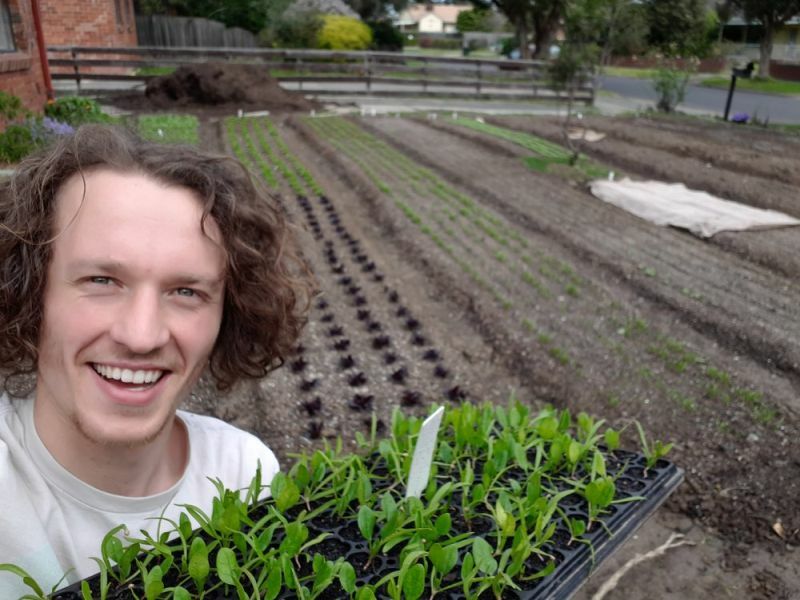 And he is growing veggies on a friend’s property in Hurstbridge. Sim grows a wide variety of veggies, leaf salad ingredients and herbs. Though he is not organically certified, he is using the organic growing model. To deliver his veggies, Sim has bought insulated zipped bags and includes frozen cooler blocks in there to keep his deliveries fresh. He has also just acquired a secondhand cargo bike to deliver some of them. There’s a lovely set up for washing and drying off the fresh veggies and herbs in the shed out the back. Sim says that drying out the mixed salad greens adds shelf life, so he uses large fans to finish them off. Sim has been using Curtis Stone’s methods from Canada as a guideline. Curtis has hundreds of videos on his YouTube channel. He has also has written a book The Urban Farmer: Growing Food for Profit on Leased and Borrowed Land about practical methods of supporting yourself with urban farming. Sim’s property was covered with couch grass so he used a turf cutter to lift the top layer of grass and then cultivate using the native soil and added bulk compost mixes. He has tested his soil for heavy metal contamination and is being careful to make sure that there are no unwanted non-organic additions. You can also test your soil for a small donation through Vegesafe program run by Macquarie University. He has also put in a polytunnel in the back for seedlings. You can buy Sim’s weekly veggie boxes online. Alternatively, his farmgate at 38 Coomalie Crescent, Heidelberg West is open for sales on Saturday from 11am to twilight (say, 7pm) and on Wednesday, from 4pm to 8pm. You’ll spot the big produce box. He may be around the back, so just give him a hoy! You, as you participate in traditional and sustainable food systems. Locals who entrust land to me. Chefs who make tasty meals. Friends who volunteer time and eat the freshest food it can buy. Artists like Kelsey Reist who create and capture photography. Such a wonderful initiative. Well done Sim. 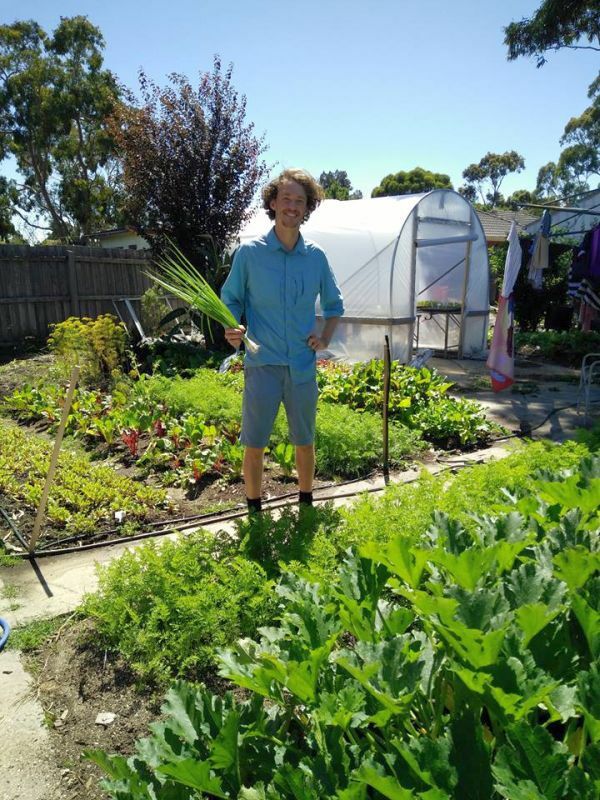 We need more CSAs in Melbourne. Congratulations to both Marina and Sam for this inspiring story. Sam deserves to be known and supported for his hard work and entrepreneurial enterprise. It goes to show anything is possible even in rented properties.